SOMERVILLE - "The whole point of playing an acoustic guitar is not to unplug. It's to get raw and draw blood. 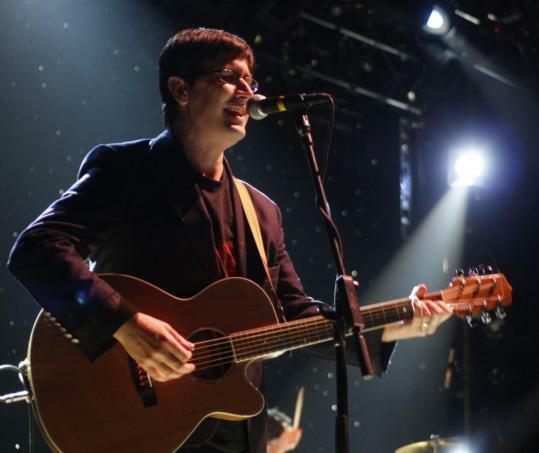 Bring along some fresh bandages," suggest John Darnielle of the Mountain Goats and John Vanderslice in the pitch for their Gone Primitive tour, which stopped in Somerville this week. It's always a good idea to have something on hand - a trusted friend, irrational optimism - to stem the bleeding at a Mountain Goats show. Darnielle's job is to rip scabs from wounds, and he's been cheerfully hemorrhaging for years in the most tuneful, literate, brutally frank fashion imaginable. On Wednesday, Darnielle bleated a couple dozen songs, many plucked from the more obscure corners of his vast catalog, including "Going to Alaska," introduced as the first-ever Mountain Goats tune, and several sublimely skewed cuts from a forthcoming concept EP (a collaboration with Vanderslice) about harvesting organs on the moon. The stripped-down setting hardly diminished the blunt force of Darnielle's music. Strumming wildly or delicately, singing radioactive divorce anthems ("No Children"), hypochondriacal fever dreams ("Beach House"), and one unimaginably tender ode to a double suicide ("Cobscook Bay"), Darnielle is a one-man monument to the absurdity of human existence. "I saw the future in a dream/There's nothing in it," he barked in "Black Pear Tree," the title track from a vinyl- and tour-only EP Darnielle recorded with Kaki King. That about summed up the takeaway message. And yet Danielle offers hope - you, too, can transcend, provided you keep your cards close and your expectations low - and it arrived during an exhilarating two-song encore from "The Sunset Tree," the artist's autobiographical 2005 album dedicated to victims of domestic abuse. "The Day the Aliens Came," which was written for but not included on the project, reframed a teenager's fantasy life as nothing short of salvation. In closing, on "This Year," Darnielle modeled his current survival strategy, which is to write jubilant choruses. "I am going to make it through this year if it kills me," he yelped, with plenty of help from fans who know the feeling. Vanderslice, who produced "The Sunset Tree," is a more conventionally agreeable sort of performer, with a voice as reedy and lovely as Darnielle's is difficult. Like his tourmate, though, Vanderslice is a sharp observer with a slanted perspective and whip-smart pop instincts, and his opening set was alluring. Unfortunately, the simpatico pair only performed a handful of songs together, which felt like a wasted opportunity.